Amid glitz and glamour and in a colourful ceremony Sunday night, Delta State Governor, Senator Dr Ifeanyi Okowa emerged the “2018 Silverbird Man Of The Year Award”. At the event which took place at the Eko Hotels and Suites, he dedicated the award to Deltans for their peaceful disposition and support for his administration. The Presidential candidate of the Peoples Democratic Party (PDP), Alhaji Atiku Abubakar presented the award to him. 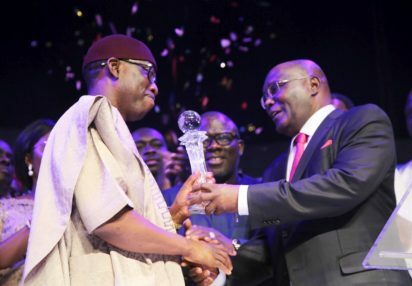 PDP Presidential Candidate, Alhaji Atiku Abubaka (right) presenting the 2018 Silverbird Man of the Year Award to Delta State Governor, Senator Ifeanyi Okowa, at 2018 Man of the Year Awards. Present at the event were the President-General of Ohaneze Ndigbo, Chief John Nnia Nwodo who chaired the occasion, as well as the Chief Executive Officer of Silverbird Group, Senator Ben Murray-Bruce. Other award winners were Governor Seriake Dickson of Bayelsa State (Extraordinary Achievement Award), Governor Kashim Shettima (Extraordinary Personality and Achievement Award), Genevieve Nnaji bagged Lifetime Achievement award with Bisi Olatilo, Omotola Jalade Ekeinde and Dr Joe Okei-Odumakin while Dr Abel Ubeku, Alhaji Maitama Sule and Dr Alex Ekwueme recieved Post-Humus awards, among others.